Boy, don't know where these weeks have flown. I have been here three weeks today, or is it four? I've gone into production mode. After a lifetime of sewing, for a multitude of reasons, I never touched a sewing machine after moving to NM in 1993. Back here for the summer, I've been loaned a machine and have started reacquainting myself with sewing and quilting. 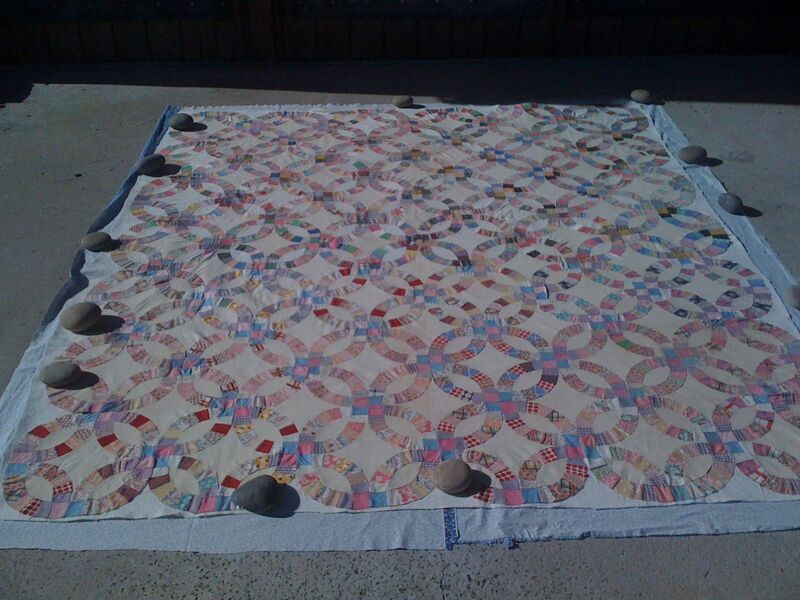 Yesterday my good friend Annie came and helped me lay out this antique quilt top on its batting and backing. Its pattern is called Double Wedding Ring and it is all hand pieced. I bought it in the Arroyo Seco Mercantile some years ago, purchased from an estate, probably, and most likely from Oklahoma, where the owner of the Merc did a lot of her inventory shopping. I have this really big thing about wanting to "rescue" hand work done by generations past and I can get almost weepy thinking about my stuff ending up under someone's dog or worse some day in the future. Anyhow...this top is in good condition and has never had its mission finished...so it's on its way now! We used this new (to me) stuff you can spray on the batting and then the fabrics adhere easily. No hours of pinning!!! Yay! Because this went together so easily, I was able to start "quilting" it last night. I use that term gingerly, because I know there could be some real quilters reading this...I should probably say I've started stitching it together. I chose to use some red thread so I can see my work when it's finished. Annie and I spent some reverent minutes trying to think about who might have made this quilt top...it is most likely from the '30s or '40s, based on the fabrics...I am not the trained eye to know for sure. Perhaps if you are reading this, you can let me know if you know. I wish I could tell this person I love her work and appreciate what she did. I wish she could see it being loved. I wish she could know it will be finished. Here's to you, whoever you were. I wish we could have met. I wish I could have known what your life was, how long it took you to do all this, where the fabrics came from and what you thought about when you did this amazing piece of work. Most of all...thanks for leaving me such a treasure. Thank to both of you for appreciating it. Martie: I've two quilts like you have photographed. 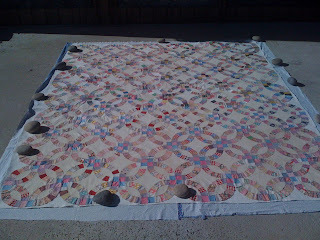 The wedding ring quilt was a gift to my mother and father on their wedding day in 1942. 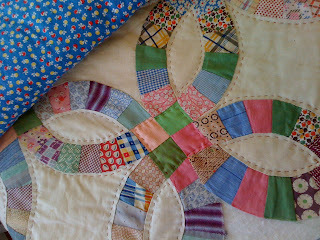 The blue fabric quilt is also the same pattern of another I own and it comes from the 1950s. Can't believe it. My mother bought more quilts than anyone in the family. She was not a crafts person, but she loved my aunts and cousins that were. I've given a few to my daughter, but Brenda and I have kept the others. You have a big heart to rescue the craft of days past. Your art will last and prevail, I know it will. I've thought before, that when I go, I want to be sitting in a chair on our ranch house porch with a family quilt about me. Mawkish, I know. Not Mawkish at all, Jack...I think that sounds full of love and thought. I envy you having a family history of quilts! Your mom was an appreciator...that's almost as important as being the creator. I hope the current generations get on the bandwagon before too much of this great old stuff goes away permanently. In fact...think I have another post about this issue to share. Will do when I can get photographs. Thanks for the inspiration.